What do vehicles, transmissions, HVAC, and appliances have in common? Among other things, they are all historically primarily mechanical products that now contain increasing electronic and software content, which is broadly true of many product categories. While these new devices deliver unprecedented performance or convenience, the shift in product content means product complexity like never before. And, as complexity increases, so too does the probability of failure of at least some components. Unfortunately for manufacturers, reliability and warranty expectations have, if anything, become more stringent. Design for Reliability (DfR) is becoming increasingly important as products feature ever increasing electronic and software content. 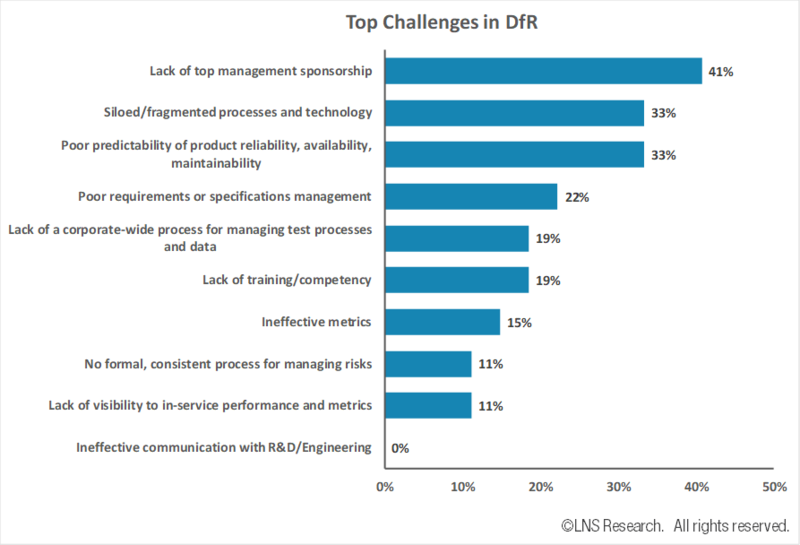 As a part of ongoing research around product reliability, LNS has surveyed several manufacturers on this topic to capture today’s DfR state of the market, objectives, challenges, and best practices. So, what is DfR, why should manufacturers adopt it, and what is the impact of Digital Transformation on it? Let’s begin with a definition of reliability. Reliability is the probability that a product or population of products will perform expected functions, for its expected life (i.e., warranty period), in an expected environment, and under expected stresses. We purposefully use the word “expected” quite a bit to emphasize the importance of developing accurate market requirements and product specifications, plus reliability’s role in quantifying products’ ability to deliver against these specifications. DfR is the framework of procedures and techniques used throughout New Product Introduction (NPI) to meet or exceed product reliability requirements. Companies deploy DfR because it's impossible to "test in" reliability — too many decisions regarding the product market, product architecture, component selection, and logistics/service plans have been made before the test lab, and these decisions directly impact reliability. It is embedded into the NPI process and performed concurrently with hardware/software development, in keeping with systems engineering principles where applicable. There are many DfR procedures and techniques. LNS Research’s data shows that the most widely adopted method used within DfR is Failure Mode Effects Analysis (FMEA), which 89% of the surveyed population has adopted. By contrast, simulations are used for DfR by 39%, while reliability-centered maintenance (RCM) is adopted by 17% of the surveyed population. Overall, 67% of those surveyed had implemented a DfR program, and 11% plan to implement one within the next 12 months. So, why should DfR be integral to your NPI process? It’s hard to argue with the objectives identified by the market: reduce warranty cost, increase customer satisfaction, and improve revenue, to name a few. While some cite compliance (customer, regulatory, or industry), the vast majority identify objectives that are clearly aligned with business success. Those that have adopted DfR programs have measurably improved outcomes. For instance, 56% of respondents say that DfR programs have resulted in product changes prior to release to manufacturing. Late cycle changes are expensive in terms of resources, finances, and time to market. Many of the respondents indicate that DfR programs improve in-service reliability, and reduce testing, among other benefits. The inputs (requirements) and outputs (in-service reliability) of product reliability engineering have been hard for many manufacturers to quantify. For most, this lack of clarity reduces the accuracy of reliability estimates made early in the product lifecycle. This has likely had some impact on the engagement of DfR early in the product lifecycle. 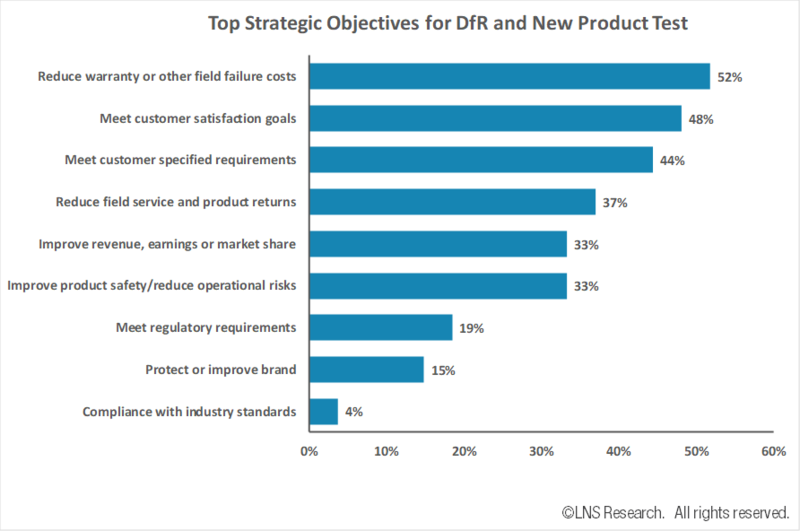 When asked to isolate the single most impactful change to improve DfR success, the highest response was earlier engagement in the product lifecycle (30%). Digital Transformation, the Industrial Internet of Things (IIoT), and concepts like the Digital Twin are transforming reliability engineering. Fielded products that contain inexpensive connected sensors can provide clarity in what was previously murky environment. The data helps product definition and DfR efforts by delivering actual use conditions, as well as data that can guide simulations. It also helps optimize the performance of individual assets using condition-based health monitoring strategies to predict potential failures on an individual machine basis, drive predictive maintenance, and improve logistics planning. However, what should be sensed, and what are the desired outcomes? 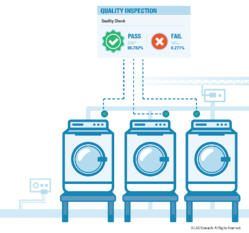 As products become more complex manufacturers must adapt NPI processes to meet reliability requirements. DfR is increasingly important to these manufacturers, is directly aligned with strategic business targets, and has been demonstrated to deliver material benefits. While not without challenges, chief among them poor predictability and lack of early NPI engagement, the IIoT can provide the answer for these obstacles given an effective strategy. LNS recommends that leaders revisit the role of DfR in their NPI process and build an effective digitally transformed DfR strategy to compete in the increasingly complex world.